Giveaway ends January 06, 2013. And now I’m logging off for the rest of the year. See you in January! out of joy that lord Mithras will come to save light. It’s time to summarize the 20 days of the Advent Calendar before tomorrow: the last day of the long Mayan cycle. The Advent Calendar is nearing the end. One more book left to give away, and a friend to talk about. 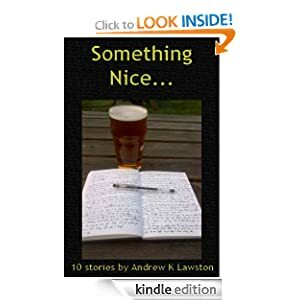 Andrew Lawston is a good bloke. He’s one of my first critics, and he supported me in my first steps as a new writer. He’s also an author himself, of funny and witty short stories. This is the last gift-away. I will be sending out all the books to the lucky victors over the next weekend. A collection of dark and quirky tales. “Write a Short Story About Growing Up. Include Three Apples and a Suitcase.” Two students grapple with fiction and the end of childhood on a summer’s afternoon. What is making Bob’s neighbours so very ill, so very often? A nursery webcam offers a chilling insight for a working Mum. A little boy is born a little bit different – to the dismay of his parents only. Captain Sharp Johnson is the galaxy’s ultimate hero, for now. But the stakes keep rising to maintain his ridiculously inflated reputation. He can save the Universe, but can he save himself? The photocopier’s possessed, and phantom coffee cups are moving round the office. What does this mean for David Swinner’s business? You are what you eat, they say. Humphrey Marten is about to discover just how literally that statement can be taken. Do you remember your unrequited teenage crush? One man’s walk down memory lane. Evian wanders a post-apocalyptic landscape in search of a career that doesn’t involve a headset and an IKEA desk. Another photo gallery today, from my “research trip” to Kyushu. This time it’s various places that show up in the books from all around the island. It was a strange feeling, to visit the places I wrote about – still, largely, unchanged and recognizable. There really is a hot spring and guesthouse in front of Aso shrine in Hitoyoshi; the forests around Kirishima Shrine are dark and mysterious; Jochibyo stairs are terrifyingly creepy. I’m sponsoring a gift-away of one of his books today: the first volume of his fantasy saga, Empire in Black and Gold. The first volume in a dramatic and colourful new fantasy series, ‘Shadows of the Apt’, concerns the fight for survival against a menacingly regimented empire. Seventeen years ago Stenwold witnessed the Wasp Empire storming the city of Myna in a brutal war of conquest. Since then he has preached vainly against this threat in his home city of Collegium, but now the Empire is on the march, with its spies and its armies everywhere, and the Lowlands lie directly in its path. All the while, Stenwold has been training youthful agents to fight the Wasp advance, and the latest recruits include his niece, Che, and his mysterious ward, Tynisa. When his home is violently attacked, he is forced to send them ahead of him and, hotly pursued, they fly by airship to Helleron, the first city in line for the latest Wasp invasion. Stenwold and Che are Beetle-kinden, one of many human races that take their powers and inspiration each from a totem insect, but he also has allies of many breeds: Mantis, Spider, Ant, with their own particular skills. Foremost is the deadly Mantis-kinden warrior, Tisamon, but other very unlikely allies also join the cause. As things go from bad to worse amid escalating dangers, Stenwold learns that the Wasps intend to use the newly completed railroad between Helleron and Collegium to launch a lightning strike into the heart of the Lowlands. Then he gathers all of his agents to force a final showdown in the engine yard . . .
A free copy of “The Shadow of Black Wings” – FOR EVERYONE! That’s right, I’m on the KDP Select bandwagon again. For a while. And there are so many new market opportunities! You can now get my books on Kindle if you’re in Canada, or Brazil, or Japan, or – soon – China. Amazon is almost everywhere these days. It is the sixteenth year of Queen Victoria’s enlightened rule and the world trembles before the might of her ironclad navy and the dreaded Dragon Corps. The largest ship ever built sails from the Brigstow Harbour on a journey to the mysterious lands of Orient. Its load – a regiment of the Royal Marines and one Bran ap Dylan – freshly graduate in Dracology at the Llambed Academy of Mystic Arts. In the empire of Yamato, sealed from the rest of the world for the last two centuries, a wizard’s daughter Sato witnesses her father joining an anti-government conspiracy. Her friend Nagomi, training to be a priestess, is haunted by dark visions that she must keep secret. Neither of them is aware that a change is coming to Yamato… on the wings of a dragon. A detailed and fast-paced historical fantasy based around the turbulent opening of Japan to the West in the middle of the 19th century, “The Shadow of the Black Wings” is the first volume in “The Year of the Dragon” saga. I’ll be giving the gift of Hobbit. There are, apparently, people who haven’t read The Hobbit. I often find that hard to believe. The Hobbit was the first proper book I remember reading. It was the beginning of everything that’s good in my life – it’s the reason why I’m here, writing these books and this blog. So let me share the greatness that is The Hobbit with you. All you need to do is have an Amazon account and fill out the form below. 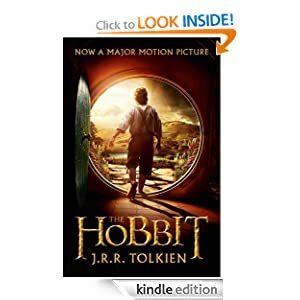 I’ll choose a person at random (or through a contest, if there’s too many of you 🙂 and send the e-copy of the Hobbit as Kindle gift. For Day 12 I have something for those of you who wait for Volume 4. Yes, it’s being written! I have just finished draft one, actually, and am now working on draft two. Here’s an excerpt from the current version. Keep in mind that as this is an early draft, the scene may change or even be removed from the finished manuscript. I tried to find something least spoilery 🙂 This will be somewhere at the beginning of the book. There was fresh blood on Dylan’s boots. It came from a puddle he had stepped into a street earlier. Or maybe from another, a block away. There was no way to know for certain; all the streets of Shanglin were bathed in blood. He stepped over a dead body and stumbled over another, lying just beside it. He didn’t look down; not anymore. They all looked the same, anyway: stripped naked, mangled, slashed with swords and burned with gunshots. Only the sizes and genders differed. The conquerors of Shanglin did not discriminate. Old men, children, women… all were piled along the walls and blood-filled gutters. The dead, black window holes of the burnt-out houses stared down at the carnage in silent accusation. Dylan didn’t bother to count the slain. How many people had lived in Shanglin before the war? Ten thousand? Twenty thousand? How many more gathered here fleeing from the besieging Imperial Army? Only a few hundred women survived, spared for the soldiers’ entertainment. Another hundred may have fled into the marshes. That was all. There’s always war in Qin, he thought. Not like this. He climbed the arch of a wide bridge spanning one of the city’s many canals, and passed Qin soldiers guarding the passage. They let him through without a word, or even a bow. Dylan was too numb to take offence, although he did make a mental note of the guards’ behaviour. Beyond the canal lay the Tianyi Gardens, where the conquering army made their headquarters. Even here there were traces of destruction and fire, though all the dead had been removed from the paths, and blood scoured from the gravel. Rose and camellia bushes were cut down to make place for tents. Soldiers sat on moss-covered boulders and stone benches around ponds, playing ma jiang for bits of Cursed Weed and money. Gold and silver coins, looted from the city’s treasure houses, were strewn all over the grass. No discipline at all, thought Dylan bitterly. This rabble would never have taken the city without our help. The Bohan set his staff up in the main lecture hall of the great Library Pavilion, a long, two-storey building with eaves like sickle blades pointing to the skies. Dylan found him studying a large map; several other maps lay scattered around the floor and tables. “Another siege?” Dylan asked. He dismissed a servant who offered him a cup of tea. Bohan stood straight, letting go of the map; it rolled up with a rustle. And you will want them again for the next battle. The Bohan blinked, and then laughed. Dylan said nothing. He turned on his heels and stomped outside, clenching his teeth and knuckles. Day 11. Today something a bit different – a photo gallery. This summer I went to Kyushu, Japan, to see how places I’ve written about in “The Shadow of Black Wings” look like today. Many locations are still standing or are easily identifiable. Naturally, the Suwa Shrine is still sprawling majestically over the city’s northern district, not far from the largely reconstructed Magistrate. The location of the Keisuke house is fictional (although not the family) but the hill district near Sofukuji Temple is still criss-crossed by a labyrinth of indecipherable narrow streets. The Takashima Residence was, sadly, blown away by the nuclear bomb, and only the foundations remain. The island of Dejima is being painstakingly reconstructed, and you can walk its streets freely – it’s now one of the city’s main tourist attractions. It’s also no longer an island. Fukusaya Bakery is now a noble institution, with tiny bits of moist cake sold at extortionate prices. I have already mentioned the few people who helped me early on in my career. Ben Galley is another one of those; a relentless pursuer of rights of self-published authors, a fantasy writer himself, Ben was kind enough to give me cover blurbs for two of the books, and host one of my first guest blog posts ever. I’m sponsoring a gift-away of one of his books today: his debut fantasy novel, The Written. They whisper that he’s dangerous. Dangerous is only the half of it. Something has gone missing from the libraries of Arfell. Something very old, and something very powerful. Five scholars are now dead, a country is once again on the brink of war, and the magick council is running out of time and options. Entangled in a web of lies and politics and dragged halfway across icy Emaneska and back, Farden must unearth a secret even he doesn’t want to know, a secret that will shake the foundations of his world. Dragons, drugs, magick, death, and the deepest of betrayals await.